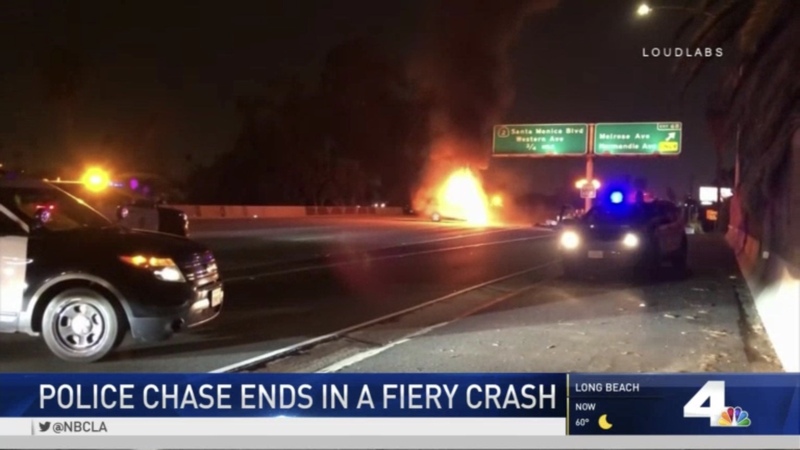 A pursuit ended in a fiery crash along the 101 Freeway in East Hollywood Monday night. The pursuit of a stolen SUV started in the Rampart area just before 7:00 PM, before ending along the Northbound 101 freeway at the Melrose and Normandie exit. Video shows a car completely engulfed in flames. Firefighters were able to knock down the flames moments later. A man, believed to be the suspect in police custody –can be seen uninjured. All lanes along Northbound 101 freeway at Melrose were shut down for almost 30 minutes before drivers were allowed to exit at Melrose. By 9:00 PM all lanes were reopen.